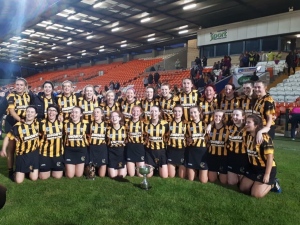 Huge congratulations to our Senior camogie team who on Friday night defeated St Brigids in the final who win the Intermediate Championship. 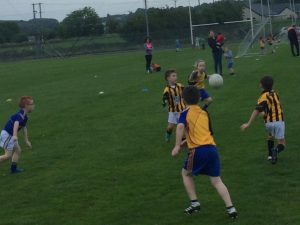 This was the second year running the girls competed in a County final. 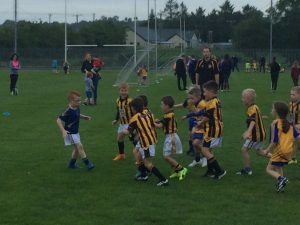 Last year they won the Junior Championship. The girls now progress to Ulster with their first Ulster Championship fixture in two weeks. 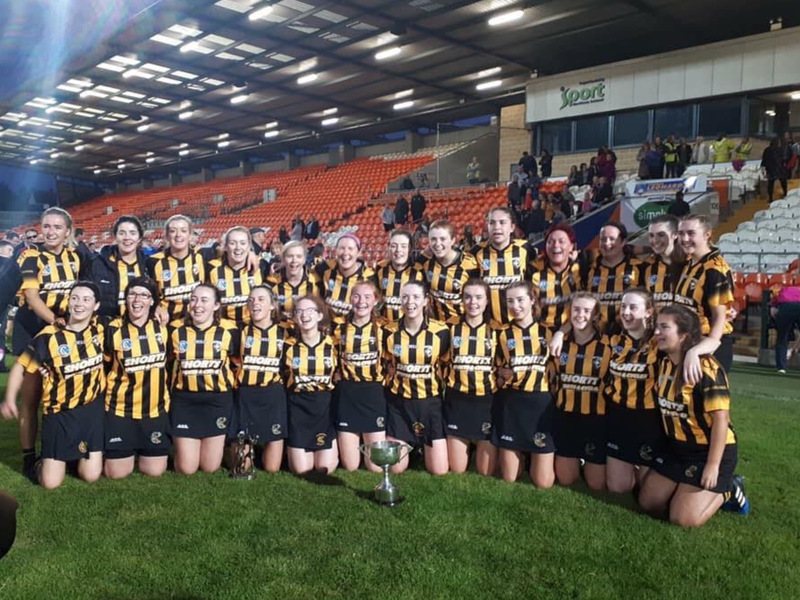 Well done girls and management on a fantastic win and the entire club sends their very best wishes and good luck in the Ulster Championship. 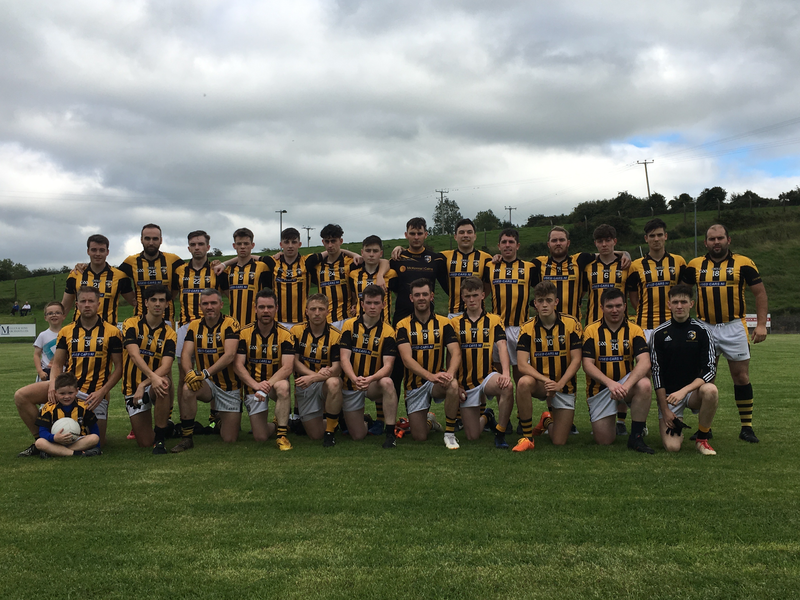 Our second game on Saturday evening saw a quick exit from the Seconds match in Grange to Madden for our round 2 Armagh Senior Championship clash. The first half was a very one sided affair with us very much in control. 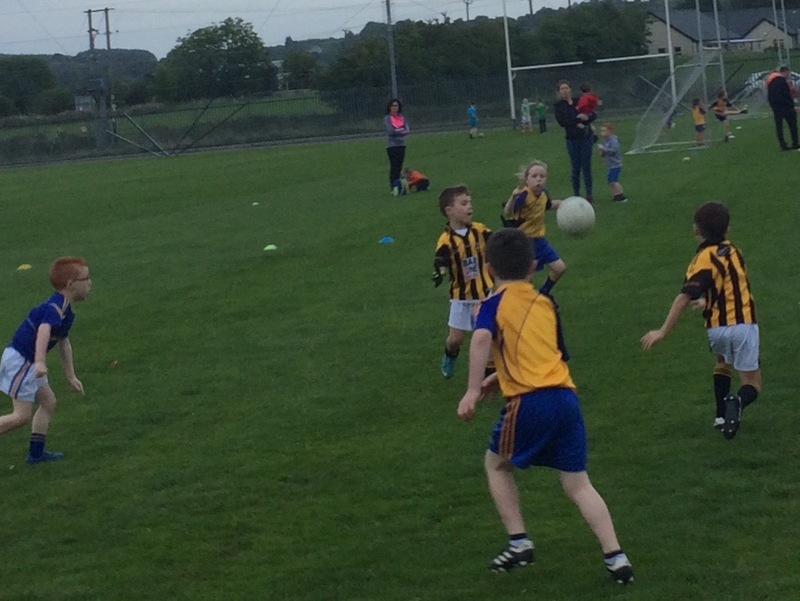 A Rain O’Neill point in the opening minutes got the scoring underway. When the game was only ten minutes old, we led 1-05 to 0-3, Kyle Carragher the goal scorer. We scored a trio of points to strengthen our lead, Madden scored a point before our second goal came as result of a super pass from Tony Kernan to Stephen Morris who put the ball in the back of the Madden net. Well done lads and management. 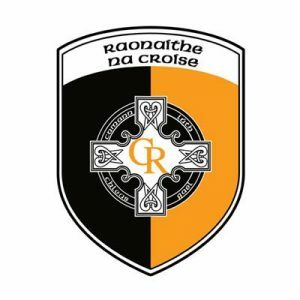 We will now play Clan Éireann next Saturday at home in the third round of the Armagh Senior Championship. 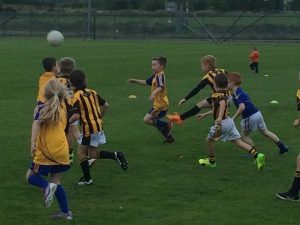 Our first game on Saturday saw us travel to Grange. 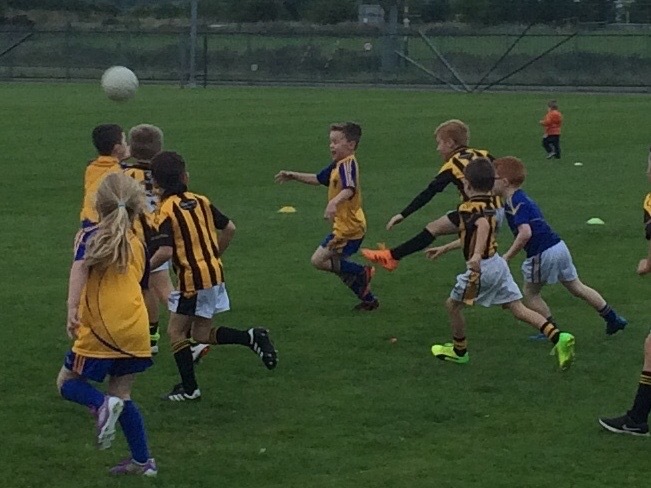 A pleasant evening left conditions near ideal for football. Two points a piece from each side and at the midway point of the first half we led, 1-05 to 0-3. 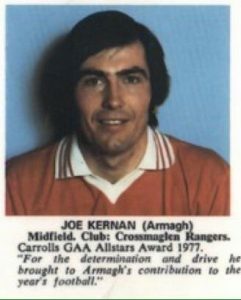 The third quarter of the game was a very even affair, John Murtagh scored three points which Grange matched and with fifteen to go we still trailed by the goal. Well done lads and management. 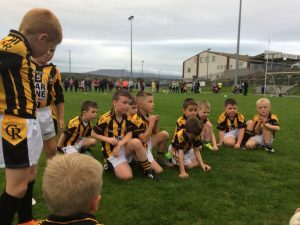 The Seconds now play Ballyhegan next Saturday in Cross at 4.15pm. 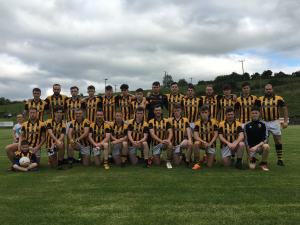 McConvilles Undertakers, The Square, sponsored the ball for our Senior Championship fixture with with Madden on Saturday evening. Thanks very much to Brendan & the Garvey family for your sponsorship and ongoing support for the club. 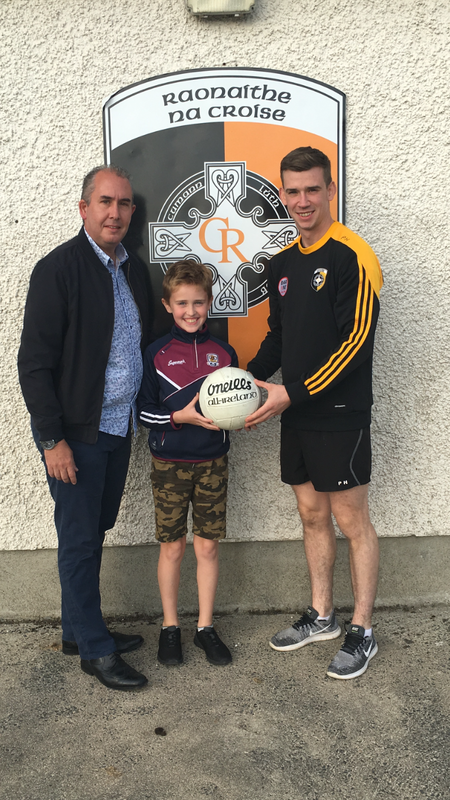 Pic Below; Brendan and Jack Garvey present the ball to Paul Hughes. 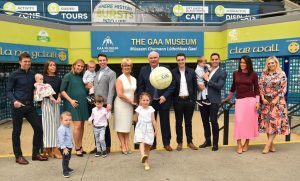 Tuesday was a very special day for our club but above all for the Kernan family when Joe Kernan was honoured with a Hall Of Fame Award at the GAA Museum in Croke Park. 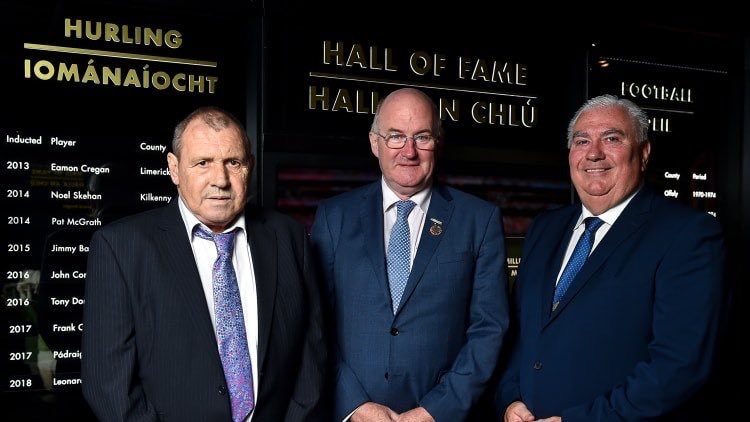 Joe, was inducted to the hall of fame along with Leonard Enright, which covered the period 1980-1984, to join other iconic GAA figures who will be forever remembered as the greatest in the game. This award was truly deserved. 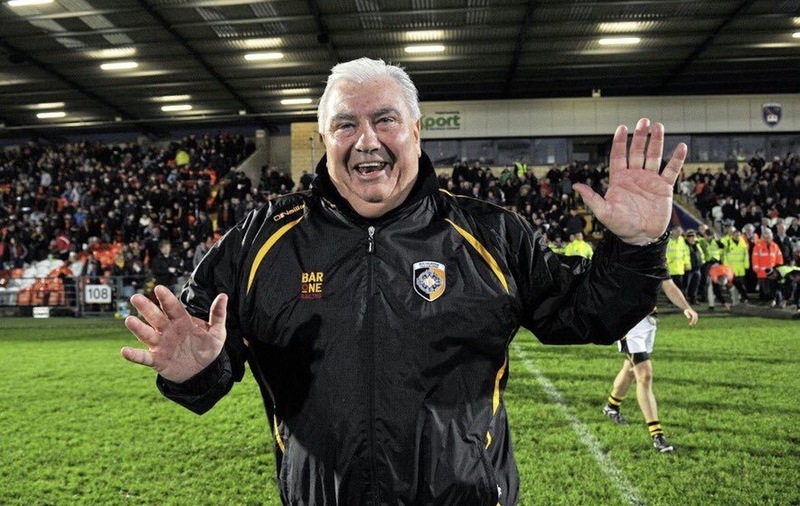 Joe’s achievements and contributions to our great game has been phenomenal but above all to the Crossmaglen Rangers club where he excelled both on and off the field as a player, manager and also in the administration side of the club. 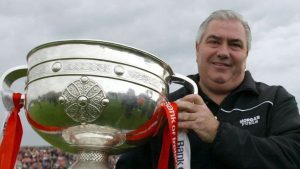 A true Gael and legend of the GAA whose achievements will be forever remembered and will be an inspiration for generations to come. 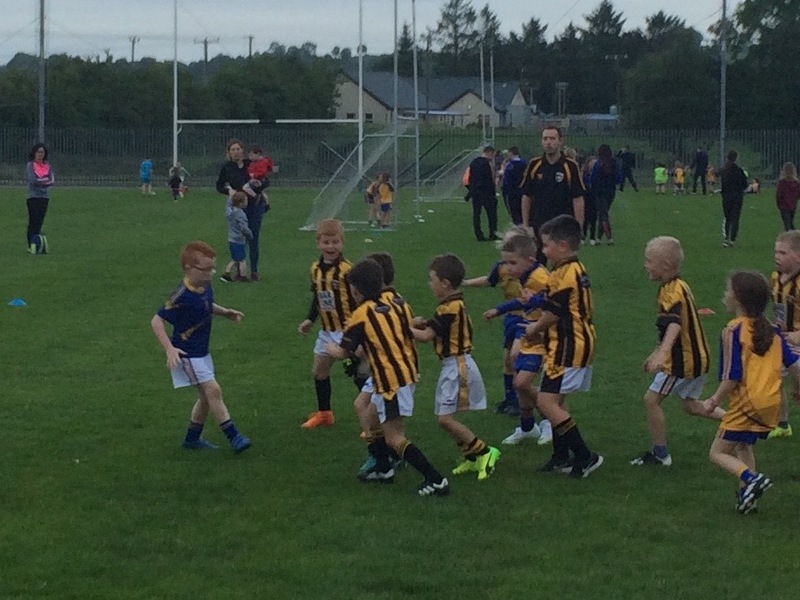 Our U6 team were in action on Friday night against Silverbridge. Well done boys and girls on a fantastic performance. Irish dancing begins on Monday afternoon, 4.15-5.15pm in the Rangers Hall. Executive Meeting, Tuesday 4th September at 9.00pm. Afternoon Tea Party- A Delightful Evening In The Company Of Friends. This Sunday, 9th September at 6pm, a very important event is taking place, an inaugural Crossmaglen Rangers tea party. Over two hundred people will attend this relaxing evening in the company of friends. 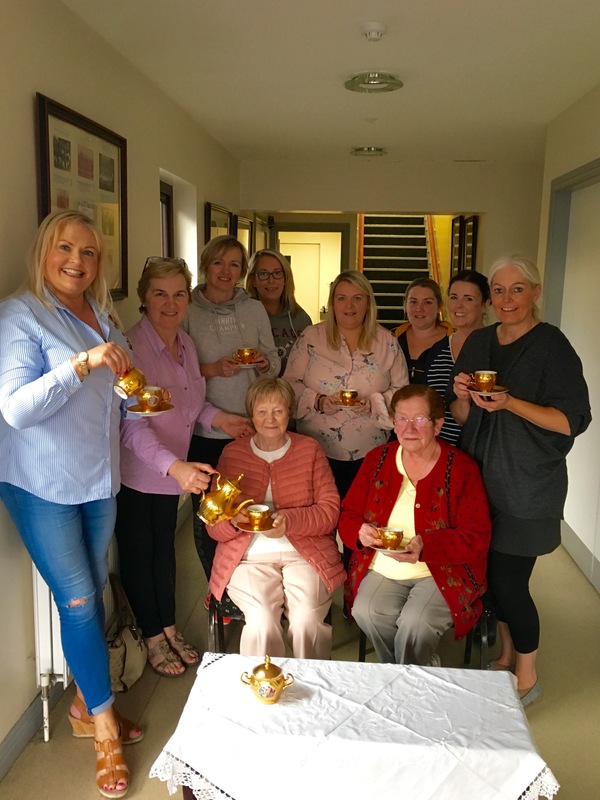 There is still time if you would like to attend the tea party, PM Cross Rangers, contact Sarah Jane Carville McGrath or Mona McEntee for more information. We look forward to welcoming all our hosts, hostesses and guests. Pic Below; A selection of our hostesses practice making the tea for our tea party! 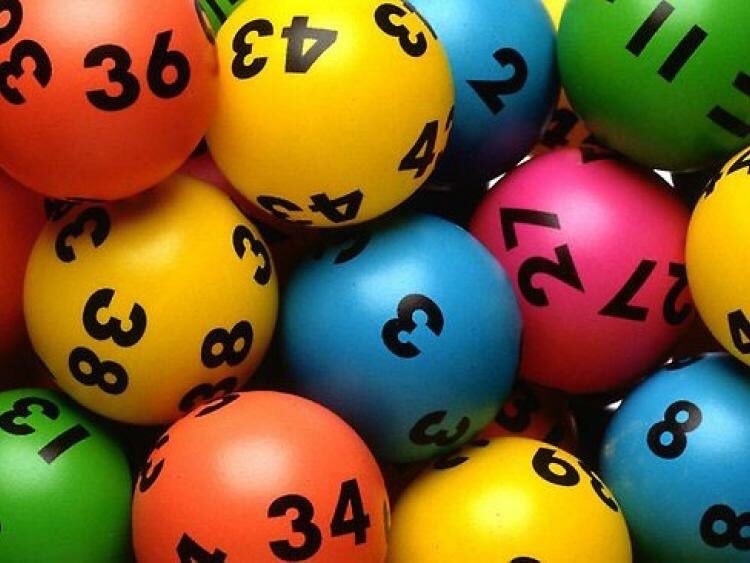 Proceeds from the draw will go directly to the underage structures in the club. 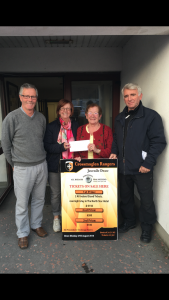 Pic Below; Maureen Nugent, winner 1st Prize with ticket seller Josie Gregory, Tim Gregory and Gene Hughes. 2 matched 3 numbers; Fiona Stuttard c/o Frances Rushe & Geraldine McConville c/o Margaret McConville win £50 each. Well done to our match three winners. Congratulations to Geraldine Hughes, Lismore & Paddy Rafferty, Forkhill who were married on Saturday. Wishing you many years of good health and happiness Geraldine & Paddy. 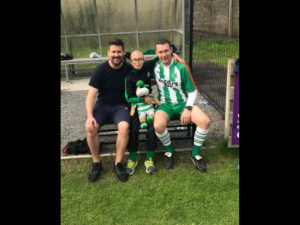 The Rodgers family , Warrenpoint wish to express their sincere gratitude to Oisín McConville who took part in a recent fundraiser in warrenpoint. 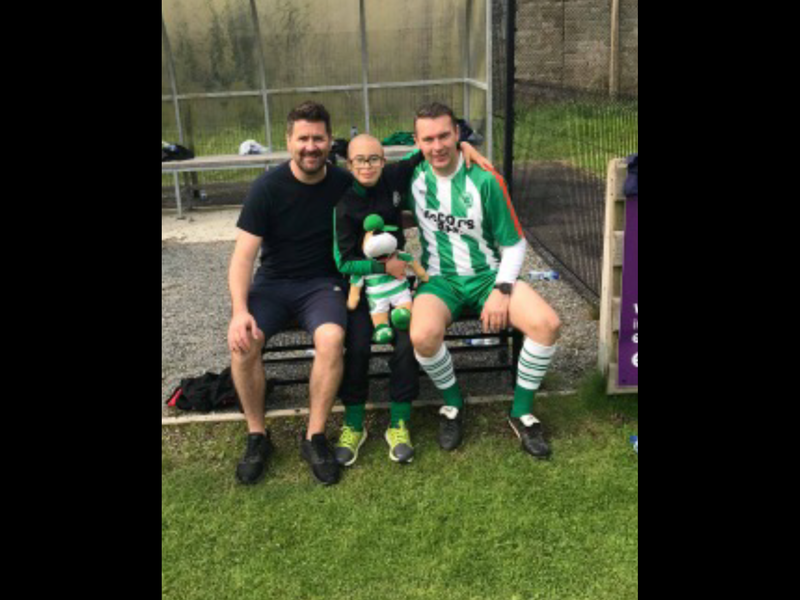 The fundraiser was in memory of the late Brian Rodgers, and all proceeds from the event went to the fantastic Kevin Bell Repatriation Trust. 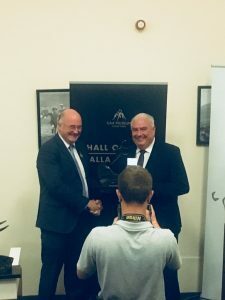 Posted: September 2nd, 2018 under Club News.